On a unique west coast charter cruise, Sistership Sailing School brings together women sailors for a week of fun and adventure -- and a chance to learn new skills. The skies were blue and it seemed like a perfect August day to arrive in Victoria to begin a six day trip Barkley Sound. Our eight member crew was all female and had traveled from such diverse places as St. Louis (Veronica), Anchorage (Kathy and Cherie), Corvallis, Oregon (Marolyn) and Toronto (Kim, Pat. T. and me) to be part of a wonderful adventure. Our skills varied from beginner to highly competent. Most of us fell somewhere in the middle. Only one of us, magical Marolyn, at the age of 73, owned a boat. Our captain was Pat Nolan whose company, Sistership Sailing School, had put the whole trip together. 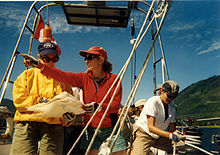 Many of the women had sailed with Pat before, either as a student in one of her learn to sail courses held in Tortola (British Virgin Islands) or on one of her other 'adventure' trips. But two of us were new converts. Pat had chartered a 51 ft. Cooper with a Swan hull and it was a fabulous boat. The groceries magically arrived with the skipper. We each brought our own libations so there would be no battle between the wine and the beer drinkers. At first, I couldn't quite figure out where all of us were going to sleep but after stowing all our gear and provisions there was plenty of room left over. After strapping two kayaks on the foredeck and charting our course the dock lines were released and we were off. Pat's 'adventure' trips are designed to be a sailing vacation for those with basic sailing skills rather than a learn to sail course. During the week, however, each of us were to add more skills to our sailing repertoire. Leaving Victoria that afternoon our first adventure would be an overnight passage through Juan de Fuca Strait and up the west coast of Vancouver Island to Barkley Sound, about 90 nautical miles. Most of us had never done an overnight passage so we were all really excited. The watch schedule was 2 hours on and 4 hours off. The voyage would take 14 hours. Watch partners Pat T., Kim, and I stood our first watch from 8-10pm. It started out as a fairly clear night so there were lots of stars and we stayed well clear of all the main shipping lanes. Suddenly that "introduction to navigation" course began to make sense. We practiced both charting the route traditionally as well as entering the waypoints in the GPS to check ourselves. I was stunned to discover how hard it was to sail by the compass at night. Keeping us on course and not daydreaming was definitely a challenge. It was chilly, so most of us slept partly clothed. We also found that it was then easier to get dressed in the middle of the night and not wake everyone else. Hitting the deck for our next watch at 2am we found it much colder but luckily the watch before us was kind enough to hand us up hot chocolate. More challenges followed: staying awake, on course and warm. Navigating through the many rocks and swift currents of Barkley Sound kept the crew on their toes! We arrived in Bamfield the next morning to beautiful warm sunshine. After breakfast, we began our wonderful 5-day exploration of Barkley Sound. Being late August we rarely saw another boat. It was like having this huge area all to ourselves. The pure beauty of places like Pipestone Inlet and anchorages like Nettle and Turret Islands took our breath away. And did we luck out on the weather. Aside from one day, we had blue skies all the way. For those of us from St. Louis and Toronto, the 9 foot tides were quite an experience. In fact, one day we were having a fabulous sail and we didn't go anywhere, even sailing close hauled, due to stiff currents. I couldn't believe it. We used the kayaks and the dinghy to explore areas where out keel would not allow us to go. When we were anchored in Pipestone Inlet, for example, we leaped into the kayaks and dinghy at high tide and headed for Lucky Creek and a lovely waterfall. Our other motive was a little soaping of the old body. The cold, cold water did not deter our daring Veronica and our bold skipper from just diving in. I, on the other hand, could barely take a birdbath. We also tried our hand as fishing. Kathy had brought her rod and was the queen of the crab pot as well. We did catch some crab and shrimp - enough for Capt. Pat to make a wonderful fish stew. After 4 days, the fog finally rolled in and with it came some rain. We decided that maybe we would pay a visit to Ucluelet, have lunch ashore, and check out the local community. A fisherman was kind enough to give us the most wonderful gift. (I think he was stunned to see 8 women on a sailboat). He presented us with 8 lbs. of fresh caught halibut. We were sure that we had all died and gone to heaven. Finally we had to begin the journey back to Victoria. En route we anchored briefly at Effingham Island so that we could go ashore and explore an old native village site. We returned to the boat to discover that the anchor windlass had packed it in. As Capt. Pat says, "It's always something". We solved the problem by winching the anchor up using the spinnaker halyard. Our next stop was Wouwer Island to check out a sea lion colony, but we didn't dare anchor, so Capt. Pat minded the boat while we leaped in the dinghy to get a closer look. Huge rocks along the shore were covered with hundreds of sea lions, some of the males as big as our dinghy. We also had a short stop at Bamfield. After a walkabout, it was back on board and then off on another overnight adventure on our return trip to Victoria. This time Pat T., Kim and I had the watch from 10-12am, so we got to sail out of the sound into the big rollers of the Pacific. It was fun. Once again, the weather gods were with us. We were also fortunate because our next watch was from 4-6am, the last one as were coming into Victoria just as the sun was rising.